Oh, Bob, I don't know if you ever answered me; what was that KnightsEnd symbol thing you have on top of that cabinet? It's awesome! It was the promotional stand for Knightsend when it came out in the 90's - you could switch the symbol around to show the smashed signal or normal Bat symbol - My brother use to bring all the promotional Batman material home from the comic store when they finished with it - I've got so much promotional stuff from that era. 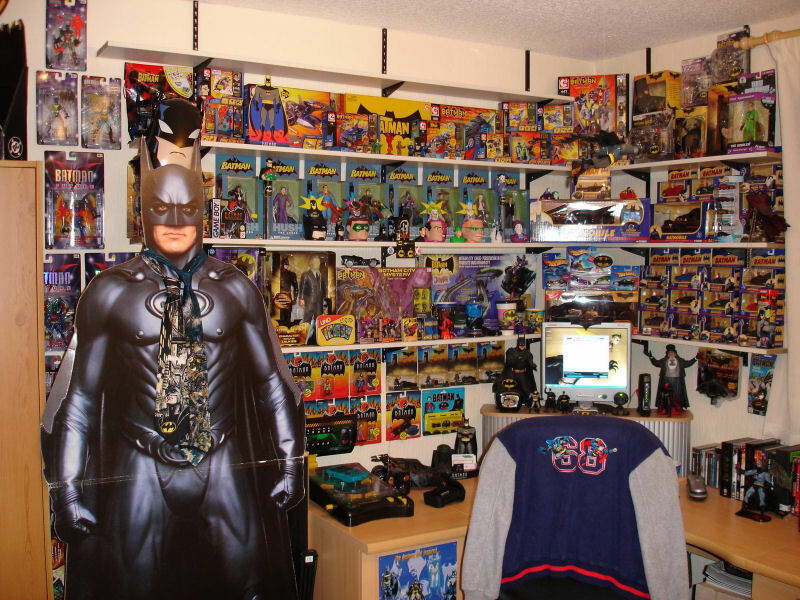 You have quite an extensive Batman collection going on. I wonder what Bruce Wayne/Batman will think if he happen to discover that room of yours? Lol Bruce Wayne's final jump before he goes back to current-day Gotham is Bob's Batman room in England. Oh, Bob... how I envy you lol. And I didn't mean that sarcastically. I'll have to get the camera out and start taking some photos! Here are a couple I have at the moment. The DC Superhero collection are amazing - I've got a similar set-up but I only get the Batman characters now. I'll get shots of the entire collection so far over the weekend Bob, I have the Batcycle too which is a beautiful piece. Now to dig out as much bat memorabilia as I can find, although my collection isn't a patch on yours anymore. The wife will only put up with so much Batman! Yeah the Cycle is awesome - I really hope that do a big Clayface special edition. Subject: Re: Let's see your collection!